Submission #2, #2 – Papa Legba se pou jodi-a ou gran chimen (2010), a painting by Ananda Leeke — originally uploaded by anandaleeke. My love affair with Haiti began when I enrolled in my first French class as a sophomore at St. Elizabeth Ann Seton High School in 1979. During that year, I became fascinated with French speaking countries in the African Diaspora. Haiti’s historical legacy as the first Black republic quickly made it one of my personal favorites. My passion for Haiti and Haitian-influenced art was deepened during my college years as a French major at Morgan State University from 1982 to 1986. Through my studies I discovered the work of Dr. Lois Mailou Jones, an artist and professor of art at Howard University. Jones’ Haitian-inspired work that included Vodun veves captivated my psyche and stayed there until I began my own studies of Vodun spirituality in the 1990s. Meeting my Haitian American college roommate and Sigma Gamma Rho Sorority sister Marie Denise (Mirabeau) Simon and her Haitian mother “Mama Freda” in 1985 helped me develop an interest in the lives of Haitian women. During one of our many conversations, Mama Freda told me about her early life in Haiti, how she studied nursing in Canada, and later moved to New York City to work as a nurse. Her stories were filled with moments when she reached into her spirit for courage and faith to live beyond any limitations people or society placed on her. My interest in Haitian women blossomed into a full blown passion during the United Nations Fourth World Conference on Women held in Beijing, China in 1995. While in Beijing, I learned about the history of Ligue Feminine d’Action Sociale or Women’s League for Social Action, the first Haitian feminist organization. 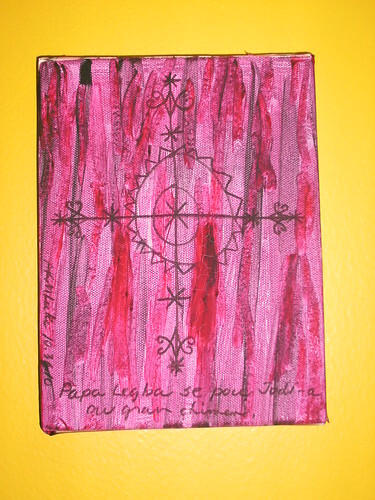 During the 1990s, I spent a lot of time learning about the Haitian love and healing goddess Erzulie, the Haitian god of the crossroads Papa Elegba, and Haitian Vodun symbols called veves. Since then, their energy has inspired my writing and art. In 2007, my debut novel Love’s Troubadours – Karma: Book One was published and included artwork on the cover and inside of the book that was inspired by Erzulie’s veve. Erzulie is also a dynamic force in the life of Love’s Troubadours’ main character. Papa Elegba makes his grand appearance in poetry and reflections included in my most recent book That Which Awakens Me: A Creative Woman’s Poetic Memoir of Self-Discovery. 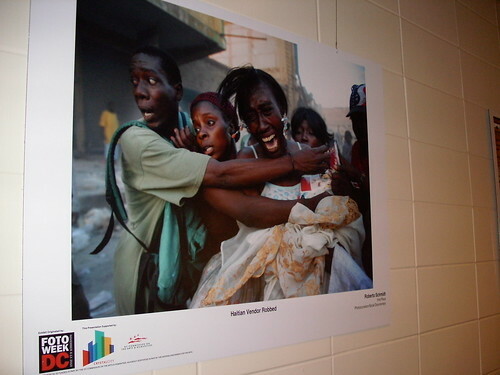 As an artist and writer living in America, I have struggled with how I express my support for the people of Haiti as they re-imagine and reshape their country after the devastating earthquake in January 2010. My struggle played itself out in internal dialogue that found its way onto the pages of my journal. I used my journal to release what I could no longer hold inside as I stood at my own crossroads. Through this process, I reconnected with the power of Papa Elegba and discovered how I could contribute my light, energy, creativity, and love to support the sisters and brothers of Haiti. The poem below captures my journey of discovery. I stand at the crossroads, feeling overwhelmed and lost. I want to run, but I know change is coming. I know I need to stay put and grounded. I know I need to take action. Papa Legba ouvre baye pou mwen, Agoeh! Papa Legba, open the gate for me. Papa Legba, forever, you have been the highway, the spiritual gateway so I might see the contradictions and opportunities along my path. Papa Legba, you are the voice of God. I repeat this prayer over and over again. It becomes my mantra as I seek to go within. It allows me to sit with the discomfort of not having an immediate answer for a question I have been asking myself since the January 2010 earthquake. How can I use my passion for Haiti, creativity, healing energy, and life to support Haitian sisters and brothers as they restore their souls, release the past, re-imagine, and rebuild their lives and country? Sometimes it’s easier to just press click and make a donation. But I am not here to seek the easy. I am here to shine my light. So I continue to sit with open ears and a willing heart, waiting with positive expectation for direction. In this holding pattern, I resist the need to move on. That’s so easy to do in America. And sometimes we forget our ancestral ties so quickly because it’s too much for our souls to bear. I baptize myself in the water of Diaspora memories so I will not forget the way my heart broke as I listened to news reports, saw photos, watched videos, read Facebook posts, and followed Twitter feeds about the devastation caused by the earthquake. I will not forget the tears I cried. I will not forget my prayers to Erzulie for an outpouring of love from everyone in the world so that the people of Haiti would know they were not alone. So where does all this waiting and remembering take me? Maybe it I am attempting to stay in my head and off my feet. I wonder as I record my thoughts in my journal and paint them on the canvas if I am holding back for fear of doing more. I get serious with myself and force an answer to the question. Am I hiding out in the wings creating my self-imposed crossroads because it’s easier to say I am waiting for Spirit to guide me almost a year after I uttered my first prayer to Elegba? Perhaps I am a lazy artist dwelling in safety, exploring my psyche when my sisters and brothers of Haiti cannot afford my personal luxury. Perhaps if I stepped out on faith and meditated on what victory would look like for the Haitian people, I’d wake up to my full self and take action. Perhaps if I banned the word perhaps from my vocabulary, something larger outside of me would happen. My third eye opens widely. The visions of victory appear. They meet me at my crossroads. I utter the words of my prayer. Papa Legba ouvre baye pou mwen, Agoeh. Papa Legba se pou jodi-a ou gran chimen. This time I move with my prayer. Action comes one person and one step at a time. Our collective love, energy, and power fuel the change. I can give my art and poetry as gifts and fundraiser donations to remind people of their oneness with Haiti and her daughters and sons. I can volunteer my time to serve as a Heart of Haiti Ambassador and help raise awareness and financial support for Haitian artisans and their families. I can use my voice to tell others about the Haitian people online and offline. I can send healing love, light, and energy to the Haitian people. And I can remain open to additional solutions that will reshape and rebuild Haiti into a nation of greatness. Today I read this poem out loud several times after reading journalist Lisa Armstrong’s article about Haitian women who have mobilized themselves to fight for protection and justice for their Haitian sisters after the earthquake in the January issue of Essence Magazine. The poem and article helped me acknowledge to myself that I want to travel to Haiti to see and learn firsthand how I can help Haitian women and children on a long-term basis. Traveling to Haiti as a Heart of Haiti Ambassador with Fair Winds Trading founder Willa Shalit is one way I can begin the process of making a long-term commitment to serving women and children in Haiti. That’s why I have decided to submit my name as a candidate for the Heart of Haiti Ambassador trip to Haiti. Last year I became a Heart of Haiti ambassador because I wanted to give back to Haiti and her people. This year I am using the energy I stirred up within myself as a Heart of Haiti ambassador to teach an online yoga and meditation class on January 12 from 7:00 am to 7:15 am ET that will encourage you to open your heart to helping the people of Haiti as they rebuild their lives and country after the earthquake that happened on January 12, 2010. Click on the link to participate in the class: http://stickam.com/anandaleeke. If you miss the live class, check out the video on the same site. 009, originally uploaded by anandaleeke. 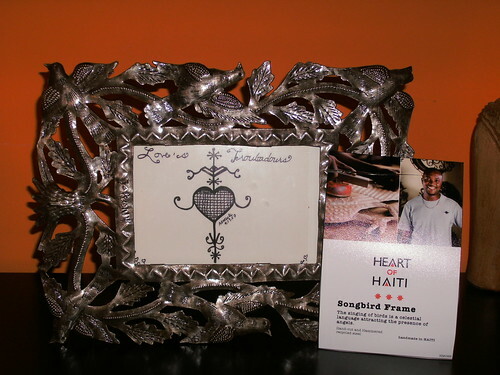 As a Heart of Haiti ambassador, I received the Songbird Frame, a beautiful hand-cut and hammered recycled steel frame created by Haitian artisans for the Heart of Haiti collection sold at Macy’s. The card that accompanied the frame stated that when the songbirds sing, they create a celestial language that attracts the presence of angels. Click here to listen to my audio blog reflections about the Songbird Frame which now sits on my art studio desk: . My drawing of Erzulie’s veve from my novel Love’s Troubadours is placed in the frame. Erzulie is the Haitian goddess of love and healing. You can purchase it on Amazon.com. During my work week, I have an opportunity to remember Haiti and her people as I walk to and from work through the Crystal City underground in Crystal City, Virgina. 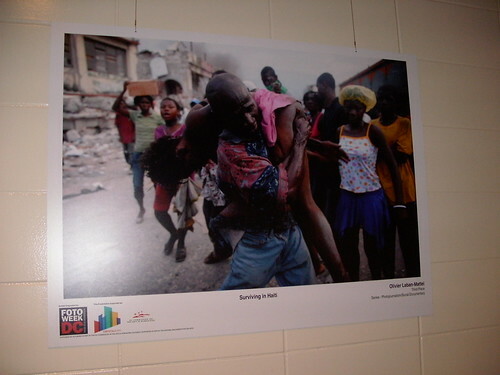 A series of FotoWeekDC 2010 photos taken during the Haitian earthquake on January 12, 2010, greet me each day. See photo above. They remind me how connected we are through our humanity and the power we each have to help another person. Click here to listen to my audio blog about the photos and my plans for keeping the heart of Haiti beating as a Heart of Haiti ambassador in 2011. As a Heart of Haiti ambassador, I was asked to blog about a fellow blogger who has a “Heart of Social Good.” Pamela Pressley, founder and publisher of The COTILLION has an overflowing “Heart of Social Good!” Pamela established The COTILLION to serve as a news resource and membership organization dedicated to highlighting and promoting philanthropic and cultural enrichment activities in the Washington, DC area and other metropolitan cities. 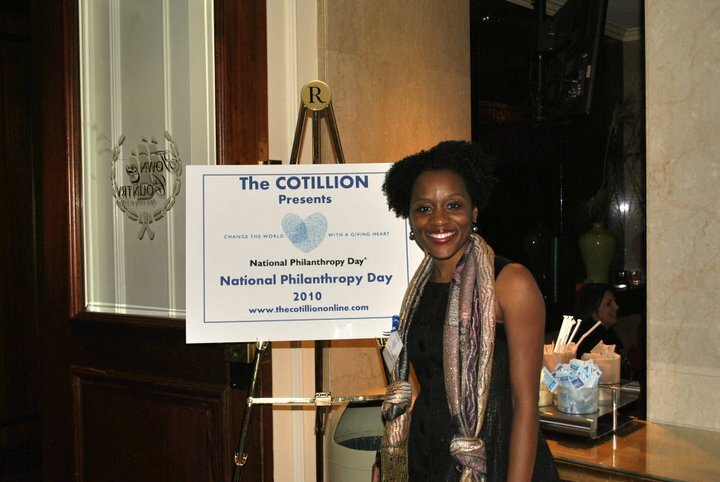 In November 2010, she organized the National Philanthropy Day with The COTILLION, an event that gave Washington DC professionals and area philanthropist an opportunity to discuss their causes or missions. Pamela and I met at my book signing in December 2009. I will always remember the way she shined her smile as she talked about her work with The COTILLION. Her positive energy, passion, and commitment to tell the stories of people and organizations who are involved in social good efforts was IMPRESSIVE and INSPIRING! In the midst of telling these stories, I have watched her personally serve organizations and causes. She has a generous spirit and shares what she knows with anyone who asks. That’s what makes Pamela a precious diamond diva with a Heart of Social Good who gives back and encourages others to do the same! Are you planning to share your “Heart of Social Good” with an organization or cause in 2011? How? Share your thoughts in the comment section below. PS: Remember to follow the Heart of Haiti campaign on Twitter to stay updated about January 2011 events. Happy New Year! My Heart Belongs to Haiti This Month! It’s been a few weeks since I last posted. Why? Digital Sisterhood Month! 31 days of celebrating women online and the connections they make, conversations they have, communities they build, causes they support, collaborative partnerships they establish, and commerce they engage in with women they meet online and offline. Visit the Digital Sisterhood Network web site to learn more. This month my heart belongs to Haiti because I want to honor the resiliency of the Haitian people who experienced a devastating earthquake on January 12, 2010. Last year I taught an online yoga class for Yoga Day USA that was dedicated to the people of Haiti. At the beginning of the class, I asked viewers to donate money to Doctors Without Borders to support their work in Haiti. Click here to watch the video. 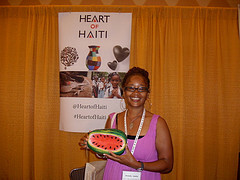 December 14th show on lessons learned from Blogalicious: I shared how I learned about the Heart of Haiti campaign from Danica Kombol, co-managing partner of Everywhere and the presentation by Willa Shalit and the Haitian artisans at Blogalicious 2010. December 20th show featuring ‘Digital Native’ Lauren Thomas, founder of Digital Aftershock: I discussed how I met Lauren Thomas, former Digital Coordinator of Everywhere, at the Heart of Haiti booth during Blogalicious 2010 and had a powerful conversation that convinced me to sign up for the campaign. I also shared how I interviewed Lauren about the Heart of Haiti campaign with my cell phone for my Cinchcast audio blog at Blogalicious. 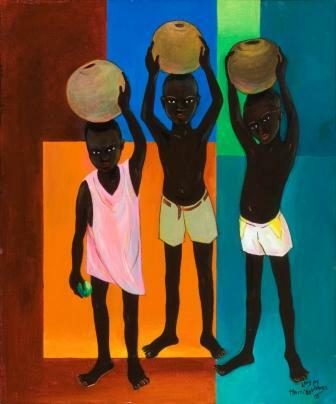 Water Carriers by Dr. Lois Mailou Jones, Haiti 1985 - acrylic, 25 ¼ x 19 ¾ in. I almost forgot to mention that I organized a Digital Sisterhood Month field trip for DC area women in social media to visit the National Museum of Women in the Arts on December 3 to see the “Lois Mailou Jones: A Life in Vibrant Color” exhibit. During her lifetime, Dr. Jones (born November 3, 1905 – died June 9, 1998), a Howard University art professor (one of my favorite artists), created a body of artwork that was inspired by Haiti and her marriage to Haitian artist Louis Vergniaud Pierre-Noel. One of my greatest treats was showing the women who attended the museum field trip some of my favorite Haitian-inspired paintings created by Dr. Jones. Check out the amazing “Water Carriers” painting on the left side of the blog post. I LOVE IT and HAITI! Drop by my blog this week and next week for more posts about my passion for Haiti and work with the Heart of Haiti campaign! Enjoy your day and week! Guess what? I am a Heart of Haiti Ambassador! You may be wondering what is the Heart of Haiti? The Heart of Haiti campaign is a Macy’s partnership that was created to provide sustainable income to Haitian artisans impacted by the January earthquake. Through the partnership, the artisans create artwork that is sold as the Heart of Haiti collection in Macy’s stores. The sales from these hand-made products including quilts, metalwork, paper måché, painting and jewelry generate the sustainable income and provide trade instead of aid to the Haitian artisans. The Clinton Foundation inspired Macy’s to create this amazing partnership. Macy’s is selling the Heart of Haiti collection at 25 stores including the Metro Center location in Washington, DC (for all my DC area folks) and on macys.com. I learned about the Heart of Haiti campaign during the Blogalicious 2010 Conference held on October 8-10, 2010, in Miami, Florida. During a speed networking session, I met Danica Kombol, a managing and founding partner at Everywhere, who introduced me to the Heart of Haiti Campaign. Click here to listen to my interview with Danica: www.cinchcast.com/anandaleeke/100144. Later that morning, I listened to a Heart of Haiti campaign presentation featuring Willa Shalit and two Haitian artisans. They discussed the powerful work they are doing to create artwork and support Haitian artisans as they rebuild their lives after the January earthquake. That’s when I fell head of heels in love with their work. After the presentation, I visited the Heart of Haiti booth in the Blogalicious Exhibitor Hall to learn how I could support the campaign. Lauren Thomas, former digital coordinator with Everywhere, gave me more information about the artwork and campaign. My conversation with Lauren turned into an interview. Click here to listen: www.cinchcast.com/anandaleeke/100204. A week after I returned to DC, I received emails from Lauren and the Blogalicious team about a local Heart of Haiti event at Macy’s at Metro Center featuring my favorite Haitian singer Emeline Michel. Visit www.emeline-michel.com. I decided to attend and invite my dad so he could learn more about the campaign. We were both impressed with the campaign and collection. Click here to see photos of the Heart of Haiti events I have attended: http://www.flickr.com/photos/anandaleeke/sets/72157625478398964. My dad has become a big fan of the Heart of Haiti collection. So has my mother! I plan on recruiting other family members, friends, and people who read my blog by serving as an ambassador! 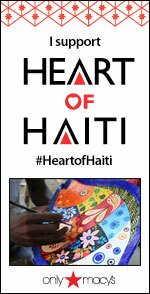 Please support the Heart of Haiti campaign by purchasing a product from the Macy’s collection this holiday season! See the links below for more information.